Nice cookie jar made of high quality glazed stoneware in the shape of a crock. 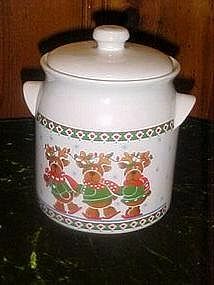 Measures 9" tall and is decorated with a lively trio of reindeer on skates. The reindeer are dressed in their warm winter clothing and wear Christmas lights in their antlers! Measures 9" tall and is in perfect condition.